It’s been a little over a month since I wrote my initial impression of the Sidi Adventure Goretex Boots. In that time I’ve had easy pavement and gravel rides lasting for hours as well as some fairly spirited single track woods riding with friends and can say that the Sidi Adventure goretex boots have come through with flying colors. Smooth tarmac, loose gravel, mud, rocks, water crossings small fallen trees and hidden obstacles have all been easily dispatched by the watertight armored boots that can. So what do I mean by all of this? Well on the pavement, smooth gravel and just plain walking about where outright boot performance is not put to the test and comfort is the deciding factor, the Sidi Canyon goretex boot has been up to the task and the more appropriate choice. On the other hand, the Sidi Adventure goretex with each wearing, seems to become more and more comfortable. I would not rate it as comfortable as the Sidi Canyon goretex, but comparing the two is like comparing an armored car and a tank. Both can do protective jobs, but you’d only really bet your life on the tank in all out war. The Sidi Canyon is the armored car, protecting you from small arms fire, like light gravel roads and the average rain storm. The Sidi Canyon gortex is the M-16 tank, capable of securing the troops from all sorts of mayhem, such as big rocks, trees, water crossings and the like. The trade off is that you are a bit more cramped in the tank than in the armored car, but when you need to protect yourself at all costs, bet on the Sidi Adventure goretex boot. One thing I really like about the Sidi Adventure goretex over the Sidi Canyon goretex is the stiffer sole. Not that noticeable while walking, it is immediately noticeable while standing on the pegs, especially when taking any hits. Far less jolt is transmitted to the feet and to my 50+ year old feet, that is a godsend. For some, that may represent a tradeoff in “feel”, but if you’ve ridden in motocross style boots, there will be as much if not more feel in the Sidi Canyon Adventure than in a pure motocross boot. However, if you’ve only ridden in street boots, you’ll notice the extra stiffness and that may take some acclimation time. It should be no big deal. There have been reports of squeaking with walking but I’ve yet to experience it which is a good thing. I’ve read reports that if it does occur, WD-40 or such lubricants will stop the noise, but the downside is that they generally dry up and would require reapplication. However as I said, I have not experienced any squeaking in over 3 months use to date. The Sidi Adventure goretex boots are also fairly heavy, significantly more than your average street boot. But if you are going to buy the Sidi Adventure goretex boot, you should be a more off road oriented rider, otherwise you are wasting your money. You’d be better served buying the Sidi Canyon goretex which is less expensive and more on road oriented. So when all is said and done, are the Sidi Adventure Goretex boots worth their significantly lofty price? For those people who spend a good deal (i.e. more than 50% of their time on gravel or off paved roads, but still want a boot that is comfortable and usable on the street; the answer is a resounding yes. They can be the single pair of boots that do it all for you. On road, off road, woods, walking about, these boots can do it all. But if you do more than 50% of your riding on pavement, you may want to look at less expensive alternatives. The Sidi Canyon being one since they can do 75% of what the Sidi Adventure can do and is signficantly less expensive. In any event, you can’t go wrong with either of these boots; it’s just that to me, a more off road oriented rider, the Sidi Adventure Goretex boot represents a very smart choice. This entry was posted on May 31, 2012 by Ride2Adventure. It was filed under Adventure, Adventure Motorcycling, boots, dual sport, enduro, Motorcycle, off road, product review, Sidi, Uncategorized and was tagged with adventure, adventure bike, dual sport, enduro, goretex, motorcycle, off road, product review, ride2adventure, riders, sidi, sidi adventure, travel. These boots are made for riding and that’s just what they will do, and if you don’t buy a pair right now they will walk right over you. Your reviews of the products presented on these pages are so professionally done, and very objective. You research everything first, try the product out for a while under different circumstances and then give your opinion. Besides travel story writing, you could easily be a full-time reviewer of various products . I don’t know if this writing business, be it about travel adventures or reviewing products, is something you did before or if you’re blossoming into an all-round writer only now, but kudos for you ! Willy, thanks for all your gracious comments. I just really like writing about things I enjoy, so it comes fairly naturally. But thanks so much. If I could only turn this hobby into something as lucrative as the daily corporate shackles…. Once the Adventure theme entered the fray in motorcycling, there has been a need for a ‘every day wear’ boot offering comfort and long day wearablility. With large feet (UK13 US14) I found Moto-X boot very hard to ride in with limits on gear and brake lever length and catching my heel on the pillion foot rests. I have looked at these boots and thank you for your input, though expensive they seem to be a good option for long distance tours if a mixture of roads are going to be ridden. I wonder what effect they will have if worn everyday for months if not years if a Round the World style trip is planned. 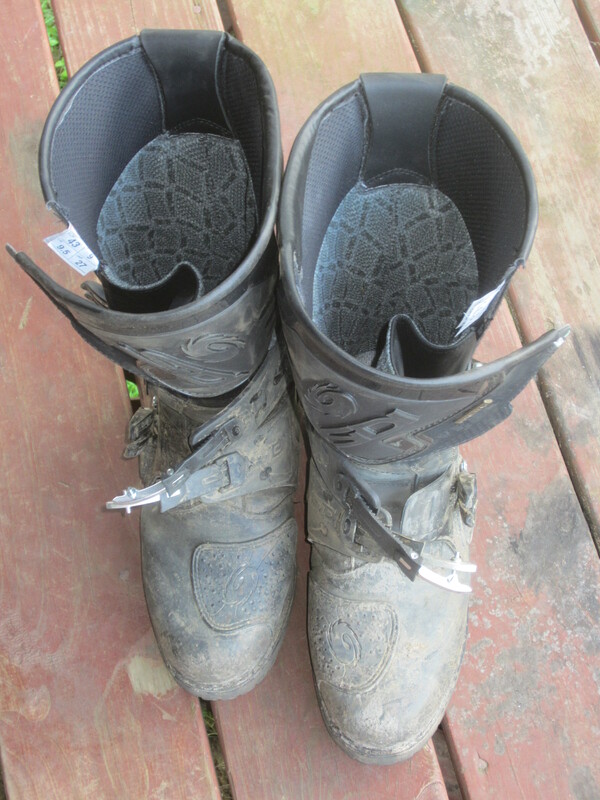 I always wondered why manufacturers of Moto-X boots made them 1) So Uncomfortable, 2) NOT waterproof 3) So heavy. Glad to see at least one company actually looking at the requirements of the rider rather than design, gizmo, shock feature marketing. We think Sidi has done a pretty good job of addressing adventure rider’s needs. We agree with you that it is about time that the boot manufacturers addressed this need and it looks like they have now broken the code and are moving out to cover this very important market segment. Thanks for your comment!